Blueline bus operators have introduced a switch - off system in speed governor to hide the reading as they crash the speed limit. Speed governor was made a must by the transport department after Blueline buses caused a number of fatal accidents. An extortionist who had been demanding Rs 50 lakh from a Noida builder has been nabbed by the anti-extortion cell of the Noida police. The institution of District Grievances Redressal and Public Relation Committee, constituted by the Haryana government for speedy justice to the public, appears to have become a mere ritual in Faridabad at the hands of the authorities. With the reputation of being one of the most hazardous cities to drive in the world with vehicle population growth surpassing that of most of the developed cities in the world, a solution appeared in 1995 when the government launched Delhi’s and the nation’s most ambitious engineering projects—Delhi Metro.. The employees of Delhi State Council of Education Research and Training will not be entitled to those benefits available to government employees, the Supreme Court has ruled. A local court today reserved its judgment in the 10-year-old Uphaar cinema fire tragedy case in which 59 people lost their lives during the screening of a Hindi film. 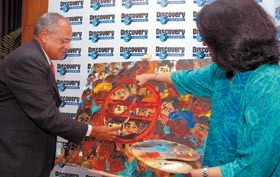 Deeeepak Shourie, EVP and MD, Discovery Network India, gives final touches to the Delhi Metro logo at a press conference in the Capital on Tuesday. 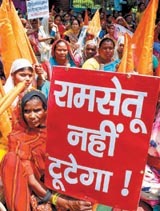 Women from Madhya Pradesh demand a better deal for auxiliary nurses and midwives at Jantar Mantar in the Capital on Tuesday. The High Court has come to the rescue of a 90-year-old woman doctor, whose property in the Green Park area was illegally taken away by her NRI grandson. The rebel Congress MP from Bhiwani, Kuldip Bishnoi and his group in Haryana are eyeing Faridabad for political mobilisation after creating a stir in Gurgaon today where the former minister and BJP leaders Rao Narbir Singh and another former minister Jaswant Singh (Bawal) joined his camp. Amity International Business School (AIBS) is starting its two day fourth annual global HR summit from tomorrow. On the 63rd birth anniversary of former Prime Minister late Rajiv Gandhi, state minister of education and sports Arvinder Singh Lovely inaugurated the Rajiv Gandhi stadium at Bawana here. He also opened the 8th all India Rajiv Gandhi gold cup wrestling and the 7th all India Rajiv Gandhi basketball (girls) tournament. Haryana Chief Minister Bhupinder Singh Hooda today urged the Centre to sanction an international airport at Bahadurgarh in Jhajjar. Speaking at the 30th meeting of the NCR planning board here today, he said that there was a need for an additional airport in Delhi’s vicinity. Chief Minister Sheila Dikshit today announced that her government would commission 32 foot over bridges (FOB) in different parts of the city. Four FOBs with escalators would soon be operational in the Capital. A racket in illegal supply of medicines of the Central Government Health Society (CGHS) has been unearthed in the city. Delhi Police have arrested four persons, Mahesh, Satish, Gugan Ram and Sanjay Kumar, in this regard. Sanjay was serving in the Ram Manohar Lohia Hospital. Chief Minister Shiela Dikshit conferred the life time achievement award on Ustad Rahim Fahimuddin Khan Dagar of the famous Dagar Bani, for his contribution to the Indian classical music, in an award ceremony here today. 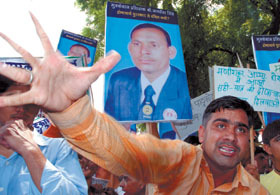 The Ghaziabad police has arrested a Bahujan Samaj Party leader Manish Pandit in a case of attempt to murder. With the arrest of four persons, Pramod, Ramzani, Pappu and Mahender, east district police claimed to have arrested a gang of robbers who were planning to rob a petrol pump. On the 63rd birth anniversary of former Prime Minister late Rajiv Gandhi, a delegation of aggarwal samaj called on Congress president Sonia Gandhi. A1Books India, the first international online book market in India and Google Books India, part of the world’s largest search engine, have joined hands to give Indian readers a complete online book experience. Delhi Chief Minister Sheila Dikshit has expressed grief over the demise of eminent Urdu writer Qurtul-ain-Hyder. Yesterday , a traffic sub -inspector in presence of an enforcement official of the transport department found the speed governor of route number 309 switched off. The driver explained it away as “ jugar technology”. Once the speed governor is switched off, the police cannot find out the actual speed of the bus. The drivers generally shoot the speed limits, resulting in fatal accidents. The speed governor shows the actual speed and the driver is challaned. If it is switched off, it does not show the actual speed. The manufacturing company has not made a provision for the switch. Technicians fit the device and connect it to the speedometer, the sources said. The authorised agency seals the speed governor. In the majority of the buses the seal was found broken. Israr, the extortionist was arrested from Baraut. He had been threatening Anil Jain, a city builder since July 15 and demanding a ransom of Rs 50 lakh. Israr had been identifying himself as a member of the G gang which was responsible for the murder of a Meerut deputy jailor. Anil Jain had complained to the Noida SSP about it who had assigned the job to the anti-extortion cell. The cell number from which the threats were issued to Jain had been purchased in the name of Rajiv Kumar Singh of Arya Nagar, Meerut. The police found that the name and address was fake. According to the popular opinion, the alleged lackadaisical approach of the political executive with regard to Faridabad is starling. The residents of this oldest and developed city have problems ranging from lack of civic amenities to day-to-day administration including matters pertaining to the police. Also, Faridabad is perhaps the second important cosmopolitan station in the state after Gurgaon, which has taken off on the path of modernisation and industrialisation at a faster pace. Hence, it deserves vigilant ministration by the government. The minister who chairs the meeting of the committee in Faridabad is Mrs Kartari Devi. Today’s meeting was officially scheduled to begin at 11 am. But only two officers were witnessed at the venue of the meeting. After more than an hour of the official schedule, the minister arrived with the front rank officers in the district in tow. The complainants, though, had come on time from different parts of the district. As per the practice in Haryana, the members on the committee are nominated by the government on political considerations. There are about 70 members on the committee in Faridabad, perhaps considered to be the biggest one in the state. Only a couple were seen present at the scheduled timing when the meeting was to commence. There were 11 points to be disposed of at today’s meeting, some of them were pending cases. According to some members on the committee, the standard of complaints remains trivial in nature. The complaints are, of course, processed and listed by district authorities. A designated minister by the Chief Minister is allotted one or more districts to chair the meeting of the District Grievances Redressal and Public Relation Committee, which takes place every month. To start with, Haryana Chief Minister Bhupinder Singh Hooda was officially the executive chairing the meetings in the district. The meetings were not held in a satisfactory manner perhaps due to hectic schedule of the Chief Minister. An alternative arrangement was made in the form of another minister H.S. Chatha, being made the incharge. However, this did not appear to have produced satisfactory progress of the committee and its meetings. On Saturday, August 25 at 8 pm, Discovery Channel will present to viewers in India the fascinating story of unmatched ambition, vision, pride and progress in its premiere programme, “24 Hours With The Delhi Metro”. The programme will also be aired on Sunday, September 2 at 9 am. “24 Hours With The Delhi Metro” is the story of how a train network has come to symbolise the present and future of Delhi, seen through the people who designed, work and use the system, in 24 hours. The programme showcases the variety of benefits it offers to its citizens, from old to young from corporate users to shopkeepers from tourists to daily commuters. With countless challenges that appeared on the way such as tunnelling under old and dilapidated buildings and structures, crossing through busy railway lines and constructing through overcrowded locations, the programme illustrates the ingeniousness of DMRC’s MD E. Sreedharan and his team. An ideal solution for bridging the growing distances of an expanding city, the programme presents how Delhi Metro has transformed the city, renewing its character and landscape. It narrates how alongside offering the city a facelift, it has empowered the economic prosperity of markets and locations by increasing footfalls into the otherwise assumed out-of-reach market places such as Chandni Chowk and residential colonies like Dwarka. The programme that took about one year to complete covers how in the current scenario of a growing class-divide, Delhi Metro has strengthened the city’s societal framework as witnessed in the range of people—rich, poor, educated, physically challenged and illiterate—who daily travel shoulder-to-shoulder through the same network. . Considered one of the finest infrastructure projects ever undertaken in India, Delhi Metro has attracted compliments from across the world for its engineering, construction speed and financial diligence. When completed in 2021, Delhi Metro is expected to cover a total stretch of 381 km, making it the second largest metro system in the world after the London Underground. In the years to come, it is expected to take off over 4.0 million commuters per day from the roads of Delhi, reducing the load from the roads, saving precious fuel, time and reducing the city’s pollution level. It also has the responsibility of the success of the 2010 Commonwealth Games. The employees of Delhi State Council of Education Research and Training (SCERT) will not be entitled to those benefits available to government employees, the Supreme Court has ruled. The court said that the SCERT was not essentially an instrumentality of the state as defined under Article 12 of the Constitution to make its employees entitled to the same service benefits, which are available to the other government employees. 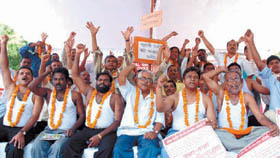 The employees had claimed extension of pension, gratuity, provident fund, advancement for better career, loans for housing, car, computers and other financial benefits to them as were available to the other staff of the government. The employees of the SCERT had tried to prove that the body stood on the same footing as the National Council of Education Research and Training (NCERT) as an instrumentality of the state and, therefore, all rules relating to other government staff extended to them as well. The Delhi High Court had accepted their plea and held that SCERT was an instrumentality of the state under Article 12 of the Constitution and all rules of the government employment applied to it. It rejected the stand of SCERT that it was only running on the grant of government, advanced mainly to improve the education related activities, particularly concerning the academics, and if this grant was spent on employees, the very purpose of the creation of the body would be defeated. A Bench of Justices P K Balasubramanyan and P P Naolekar of the apex court did not agree with the High Court’s findings and set it aside. It said such interpretation of the law relating to formation of the SCERT would defeat the very objectives for which it was created. “In the matter of education, surely, the interests of the society at large should prevail and issue of any direction that may endanger such interests must be done with extreme caution and only after careful deliberation,” the apex court said, allowing an appeal of Lt Governor of Delhi against the High Court order. On the face of the purpose of the memorandum issued for creation of the SCERT by the NCT government, the direction issued by the High Court to provide every benefit to its employees could not be sustained. The case in the High Court was initiated by SCERT employees, led by V K Sodhi some years ago. Additional Sessions Judge Mamta Sehgal, who heard the final arguments yesterday, reserved the final verdict in the case. The court, however, did not fix a date for the pronouncement of verdict. Concluding its final arguments yesterday, the CBI had held the theatre owners criminally liable for the tragedy as the emergency safety measures were not in place. Appearing for the probe agency, senior advocate Harish Salve said that the persons, who were getting financial gains from the theatre’s operation, were culpable for the lapses. The theatre had turned into a gas chamber where exit doors of the balcony were closed, leaving no scope for the victims who died of asphyxia, he said. Earlier on August 8, the accused, Sushil and Gopal Ansal, had concluded their arguments in the case and pleaded innocence. The duo, owners of the theatre, had refuted the charge that they were at the helm of affairs of the company which owned the Uphaar cinema. The prosecution had alleged that the accused were directly and criminally negligent in the management of the theatre. Fifty-nine people lost their lives while watching Bollywood blockbuster ‘Border’ in the theatre on June 13, 1997. Initially, 16 people were named as accused, including the owners of the cinema hall and they were charged with causing death by negligence, endangering life and relevant provisions of the Cinematography Act, 1952. Four accused died during the trial. “It is unfortunate that family members are behaving like sharks and vultures to the old lady,” a bench comprising chief justice M.K. Sharma and justice Sanjeev Khanna observed yesterday. The court cancelled the gift deed of the property belonging to the nonagenarian doctor Prem D Lall, which was executed by her Singapore-based grandson Chinmay Arora, in May this year. The bench asked Arora to return Rs 4.5 lakh to Lall by August 30. The money was withdrawn from Lall’s bank account without taking her in confidence. The court directed police to deploy two maidservants in the Green Park house, where Dr Lall stays alone. The court’s order came after she appeared before it in a wheel chair and recorded her statement. She said that her grandson had neither informed her about the gift deed nor, about the withdrawal of money. She informed the court that Arora had stealthily taken her thumb impression on a blank paper. Dr Lall has three daughters, who are settled abroad. She expressed before the court her desire to stay in her house and pleaded to provide security to her. The court was hearing a habeas corpus petition filed by Dr Lall’s two daughters, alleging that their elder sister’s son had illegally obtained her house and had taken her to Singapore. He never allowed any family member to meet her, they alleged. and claimed to create a flutter in Faridiabad. Gurgaon and Faridabad are two important cosmopolitan cities and important part of the politics of South Haryana. They account for two parliamentary seats in Haryana. Bishnoi has already announced to organise a rally in Rohtak, the home district of Chief Minister Bhupinder Singh Hooda on December 2. He has also announced of floating a much-awaited political party to provide an alternative to the people of Haryana. Col. Mahender Bisla, a loyalist of Bishnoi, here claimed that Bishnoi was getting a satisfactory response from the people of South Haryana, especially the Ahirwal belt. He cited the case of Rao Narbir and Jaswant Singh who were senior Ahir leaders of South Haryana. Rao Narbir Singh has been minister in Haryana several times and also son of one of the great leaders of South Haryana, late Mahavir Singh. Rao Narbir Singh has made it clear that he would contest from Mahendragarh in South Haryana in the next parliamentary election. Bisla said that Bishnoi will not get into the Congress fold and the proposed political party will have no alliance with any political party in the coming election in the state. To the criticism that many leaders in the Congress who were close to Bhajan Lal do not consider Bishnoi as their leader, he countered saying that senior leaders from not only the Congress but other parties, including those having national stature were joining the movement. Pro VC of Leeds Metropolitan University (UK) Prof Stephen Parkinson would inagurate the two-day summit. Distinguished corporate stalwarts will be honored during the two-day summit. Panel discussions by panelists including, Dr R.K. Khandal (Director, sriram institute for industrial research), Manoj Jha (MD, minda sai limited), Indu Wadhwa (Sr VP, HR and IR, G4S security services India ltd.), and K. Kalra (secretary general PHD chambers) will also be held. More than 500 wrestlers from different parts of the country are to participate in the tournament. The tournament will carry the prize of Rs 1 Lakh each for wrestling gold cup and basketball. Singh said that the government would try to create interest among students towards sports, so that their overall personality is developed. He said that Rajiv Gandhi loved sports and this was the reason behind the launching of various sports projects during his tenure. He said that keeping in view the forthcoming Commonwealth Games, the state government would upgrade sports in schools here. He added that the government would prepare an action plan to provide better infrastructural facilities in schools like- stadium, sports complex, etc. MP Sajjan Kumar, MLA Surender Kumar and senior officials of education department also attended the programme. He claimed that the state government had submitted a proposal for an airport at Bahadurgarh, which would have excellent connectivity with Delhi and other areas of NCR, through the KMP Expressway. He urged the board to impress upon the ministry of civil aviation for the early sanctioning of the project. Stressing the need to speed up work on road and rail projects between Delhi and NCR, he urged the NCR planning board to impress upon the ministry of road transport and highways to take up the construction of Badarpur fly-over, which has been pending since a long time. This would provide safe and convenient passage to pedestrians, including physically challenged persons and elders. She announced this while christening a three-level fly over at Punjabi Bagh as Hans Maharaj Setu. Hans Maharaj Setu is situated at the intersection of NH-10 and Ring Road. The setu is facilitating smooth flow of traffic with the main flyover, a rotary at the ground level and an underpass for enabling the to and fro traffic between Rohtak Road, Peeragarhi side and Rohtak Road, Zakhira side. The alleged accused used to supply stolen medicines in the open market by preparing fake OPD slips. Information was received by the police about one Mahesh, who was the receiver of the stolen medicines, which he would further sell in the open market at a low prices. Mahesh was arrested while he was striking a deal for the medicines with an employee of the CGHS dispensary, Ashok Vihar. Raids were conducted in the dispensary and related documents were seized. Other links in the chain were also established and three more alleged accused were arrested. One CPU that was being used to reproduce signatures of the doctors was also recovered. A citation and award money of Rs 11 lakh was presented to the Dhrupad maestro. Political leaders, senior government officials, dignitaries, members of music fraternity and selected invitees were also present. The function was organised by the Delhi government and sahitya kala parishad. The CM said that Dagar is not only known for the power and spontaneity of his aalaap, but also for his rich repertoire of composition. His music combined with the distinct style of his singing has captivated listeners beyond borders. Dikshit added, “We feel proud in honouring a personality, who has been dominating classical music. Earlier, the sahitya kala parishad had honoured M.S. Subbulakshmi with the award. Abut a fortnight ago Ashok Sharma had lodged a complaint with Kavi Nagar police station that Manish and his nephew had fired at him when he was passing the Rajapur railway level crossing. The second accused has not been nabbed as yet. Manish Pandit had fought the Assembly byelection from Ghaziabad in 2004. According to the police ,there are at least two dozen serious cases against Manish Pandit. A case under the National Security Actmay be registered against Pandit. Information was received at the New Ashok Nagar police station yesterday that about five persons in possession of weapons were hiding in the bushes near the CNG pump opposite Mulla Colony. A raid was conducted immediately after receiving the information and all the four alleged accused were apprehended. On the 63rd birth anniversary of former Prime Minister late Rajiv Gandhi, a delegation of aggarwal samaj led by Ajay Gupta, son of former Haryana Chief Minister Banarsi Dass Gupta, called on Congress president Sonia Gandhi and apprised her with the objective of the foundation. He presented Sonia Gandhi with a cheque of Rs 1 lakh for the Rajiv Gandhi foundation. Darshana Gupta, daughter-in-law of Banarsi Dass Gupta, patron of Delhi Aggarwal Sammelan was also present. Now one can search for books and simultaneously purchase them. The search for the books can be done on books.google.co.in and the purchase can be completed on www.a1books.co.in, a press note stated. Dikshit added “with the passing away of Qurtul-ain-Hyder, our country has lost a writer who started her literary journey in 1947. Her death is an irreparable loss to the Indian literary fraternity”.